The most powerful and easy-to-use-segmenting software in the world. 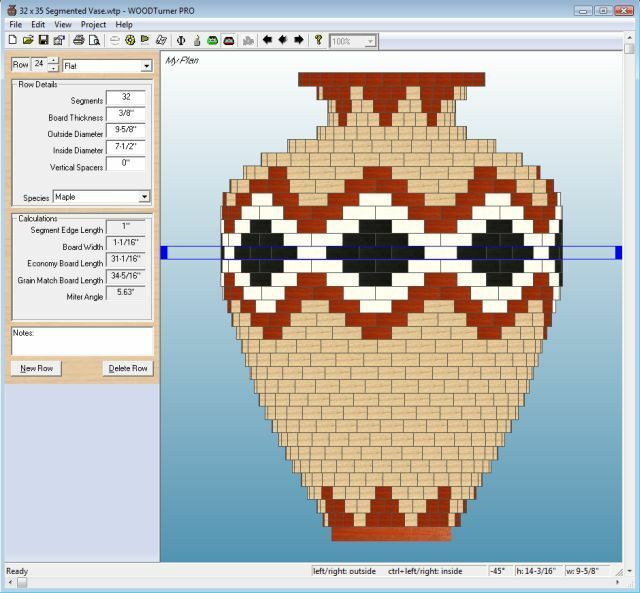 Create vessels using solid disks, closed segments, open segments, staves, compound segments, veneer rings and even spoke and wheel configuarions. 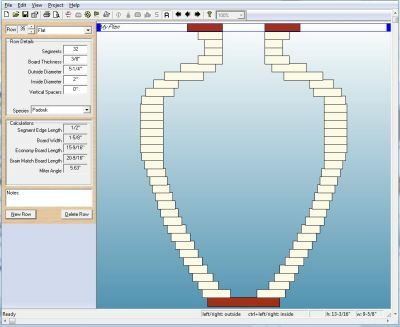 Once you transfer your wall profile from 3D Design PRO to Woodturner PRO, you can click the ProfileSNAP button and all inside and outside diameters will immediately SNAP to the wall profile. 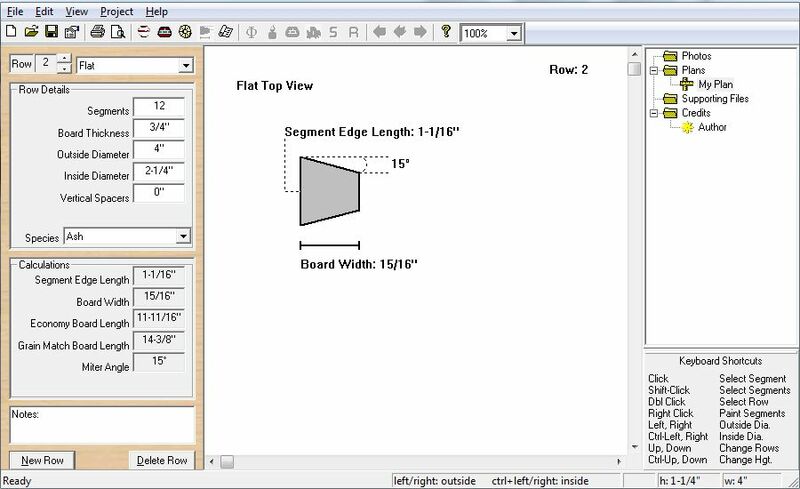 Use the overlay to see height versus width Fibonacci ratios. Use major Golden Section lines to see where to position the feature ring. 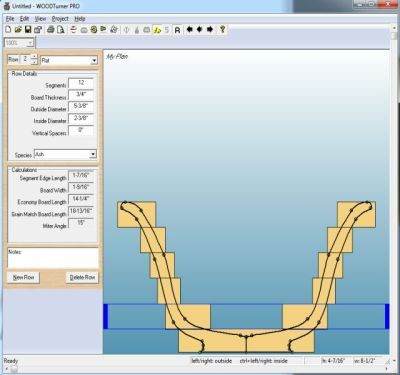 Use minor lines to determine how wide the mouth and base of a vessel should be relative to the overall width. 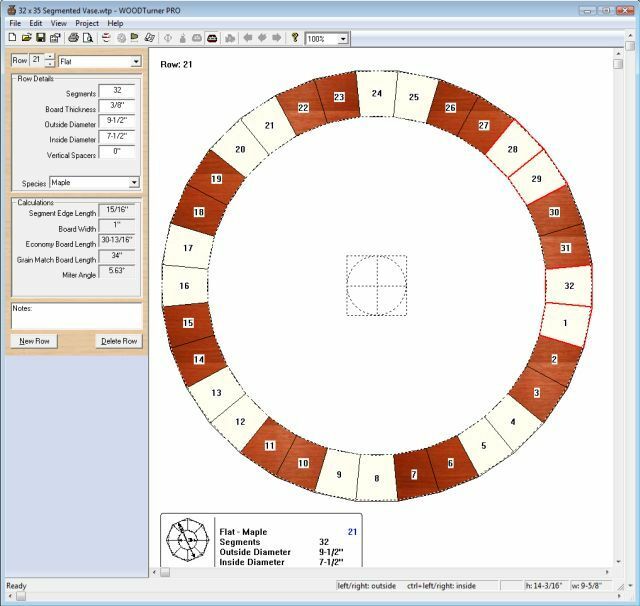 Visualize the complete design, including a feature ring created in Lamination PRO. Once you identify the rings that are to be part of the selection, you can change all the details of the selected rings at the same time. 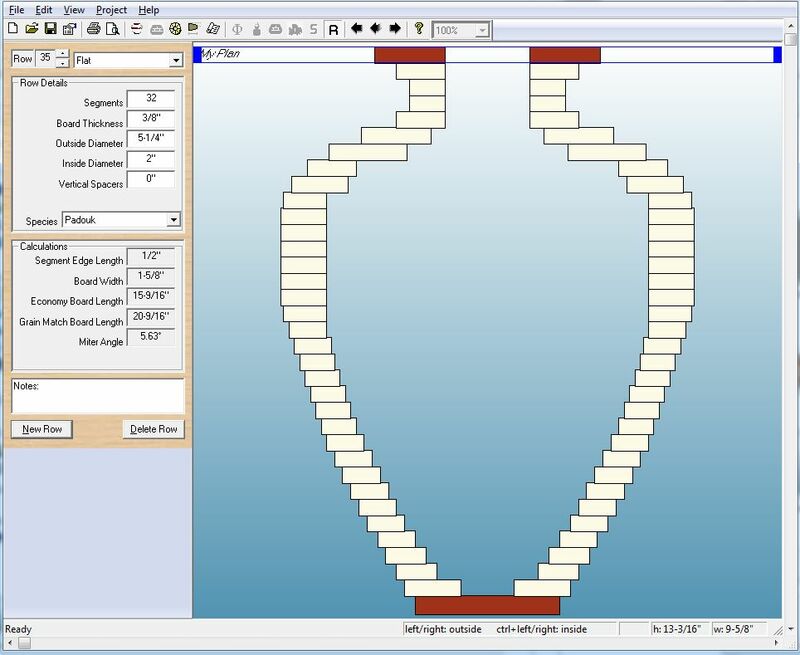 Before painting segments, tell the software how many times per row the painting is to be repeated. Woodturner PRO has been designed for ease of entering and modifying ring details and displaying results in a visual as well as a printed output. 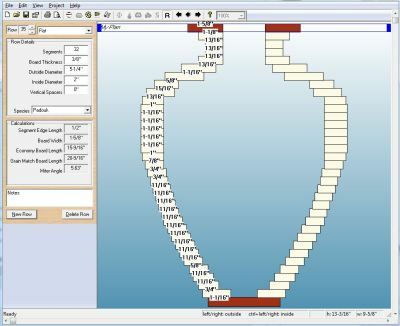 As you add rows of rings to your drawing, you can specify the wood species which will paint each segment in that ring using a photo image file. Dozens of species are included in the software and you can add as many additional species as you like by simply browsing to an image file and providing a name for the species. Arrowkeys give you a quick way to modify ring diameters and navigate between the rings. 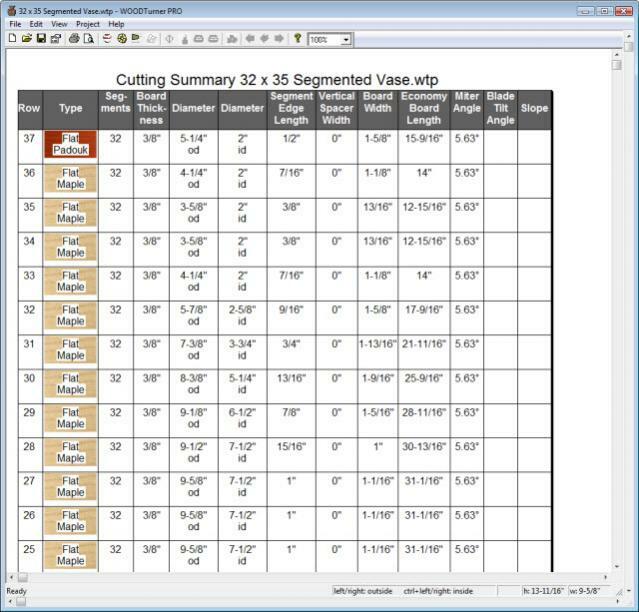 Toolbars give you quick access to aids such as grid lines, glue surface widths and wall profiles.The calculations window shows the exact segment cutting instructions necessary to create a ring of the specified dimensions. The Vessel View shows all segments painted with species of your choice. Dozens of species are included and you can add your own by simply copying image files into a folder. This view allows you to rotate the vessel to the left, right or continuous rotation. The C utaway View shows you the outisde and inside diameters of each ring and is the primary view for adding new rows to the vessel. The Ring View is a full-size image of the currently selected row. It shows segment numbers and is painted with a color that closely resembles the species. 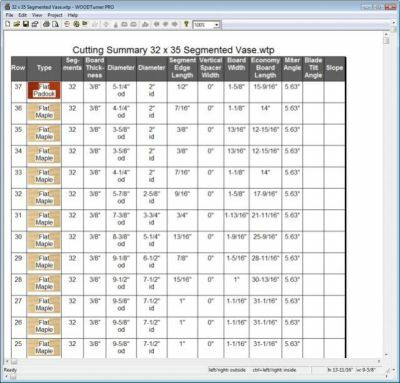 When printed, this page also has all the cutting details and instructions for creating the ring. This view is particularly helpful in placing the various segments in their proper location. 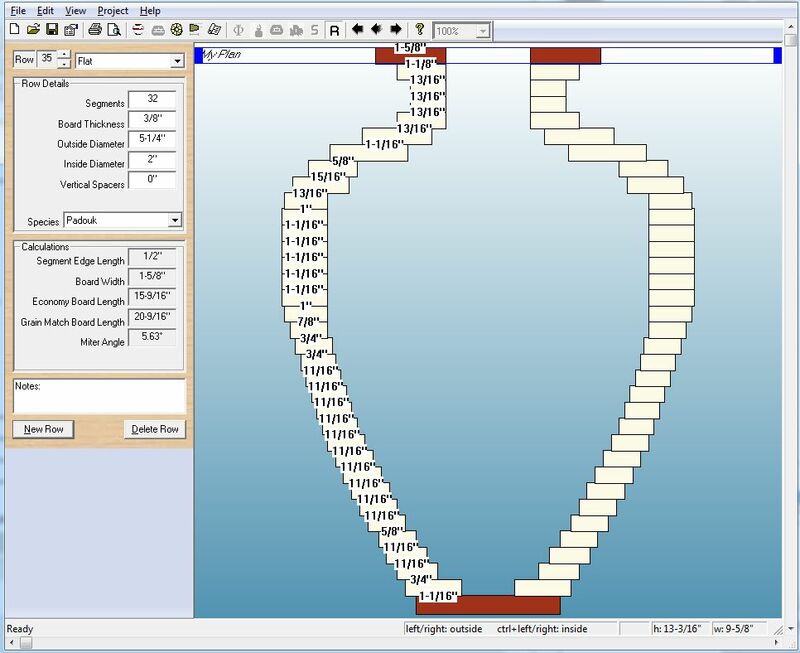 The Summary View is a printout of the entire vessel which includes a single line for each row. This printout shows pertinent details for creating each row. You will typically print this view to take to the shop when you're ready to create the vessel. The Segment View shows one segment in detail from the currently selected row. The Golden Ration overlay gives you the ability to make design decision based on the Golden Ratio. 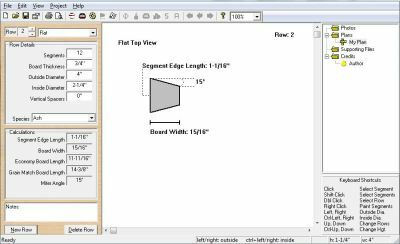 For example, you might use the ratio to determine where to center a feature ring or how wide a vessel might be based on the height. It has both major and minor ratio indicators. The Glue Line overlay simly shows you the width of the surface areas between two adjacent rings. 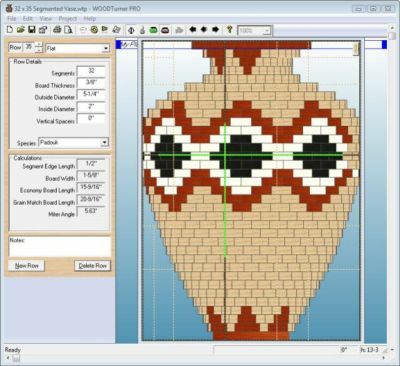 This is a fast way of knowing if you current design has enough glue surface area to keep a vessel intact. The Wall Profile overlay is a visual representation of the area that is available for your wall profile. If portions of the hash overlay turn from green to red, it means that there is a problem with how two adjacent rows have been created.